For those of you who are totally new to miniature horses, we thought you may appreciate a fact sheet related to this breed in general and answers to some of the frequently asked questions related to these horses. This breed of horse has had a rather obscure beginning although there are accounts of them for the last 300 years or so in Europe. Of course, all horses whether they are Clydsedales, Arabians, Paints, Shetlands, or Miniatures are the same species of animal. Technically speaking they could interbreed. As such, each of the different breeds of horses are a result of selective breeding for specific traits over many generations. Miniatures are selectively bred for their small size while other breeds such as Paint and and Apploosa are selectively bred for distinctive color patterns. There are two major miniature horse registries that maintain pedigrees in the United States today. The AMHR (American Miniature Horse Registry) is a subsidiary of the American Shetland Pony Club. The AMHR registers miniature horses in two divisions. The “A” division recognizes horses that mature at 34 inches or less. The “B” division recognizes horses over 34 inches to 38 inches. Horses in this registry are given temporary registrations when they are juveniles. They receive permanent registration at three years of age after being measured for height to determine what division they will be placed in. It is a closed registry meaning that both of the parents need to be registered in order for a foal to be registered. The AMHR will, however, accept foals for registry if their parents are AMHA registered. The AMHA (American Miniature Horse Association) is a stand-alone association. It recognizes only horses that measure 34 inches or less. Juveniles are issued temporary registrations in this registry also. Unlike the AMHR, however, permanent certification is not made until 5 years of age to assure that horses are fully grown prior to receiving their permanent registration. This is a closed registry and will only accept foals that have both parents with AMHA registrations. There is a hardship registration at 5 years for horses that do make the height requirements although the registration fees are quite expensive. All of our horses are registered with the AMHA. Height for both registries is determined by taking the vertical distance from the ground at the point where the last mane hairs are found at the base of the neck. * Since we mainly focus on characteristics of the AMHA miniature horses, (most of our horses also are double registered with AMHR), the statistical information that we will give below most appropriately fits with horses that will more than likely mature at 34 inches or less. * For showing purposes, all horse’s birthdates are considered to be January 1 of the year that they were born regardless of their actual date of birth that year. * For showing purposes miniatures are considered “Junior” horses through their 2 year old year. * A “Senior” horse is 3 years of age or older. * We discourage all but very small children from riding miniatures. We consider anything more than 20% of the horse’s body weight a significant load to pack. AMHA miniatures are not generally considered as riding horses. * In the winter the miniature horse gets a very long coat and it can be very deceiving about how their weight is holding. It is important to actually check the horses condition by rubbing the fingers across the ribs of the horse just below the backbone. If a “washboard” feel is evident, the horse is probably underweight and the feed ration should be increased. * We usually breed our mares no earlier than three years of age out of concern for adequate physical development of the mare at time of birthing. Others breed at two years. We believe this practice leads to more difficult birthing problems. It is not uncommon, however, for mares to remain immature until four or older. Sometimes mares will not conceive their first pregnancy until they are 7 years of age. * Many stallions are fertile as two year olds. 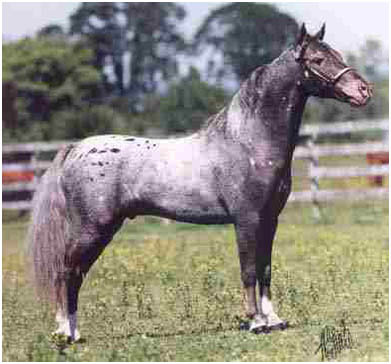 As with mares, many others are not sexually mature until they are older. Many miniature horse stallions do not have both of their testicle descend into the scrotum until they are three or older. Unfortunately, many veterinarians are unaware of this fact and call miniature stallions that are over a year old with undescended testicles “cryptorchids”. This is not the case. Miniatures mature differently than full-sized horses. * The birthing process under normal circumstances occurs very rapidly. If there are no complications, the foal is usually born within 10 minutes from the time that the mare begins active “pushing” labor. * There is a significant incidence of “dystocia” or mal-presentation births in miniature horses. It is important for those who breed miniature horses to be in attendance at all foalings to assist if there is a birthing problem. * If foals are sick, they will be listless and not nurse vigorously. It is important to seek medical attention promptly within the first day after birth in these cases. Sick foals can go “down hill” very quickly if not attended to. It is critical that they are vigorous within hours of foaling and nursing well. * Horses are shown in age divisions for the junior horses ( weanling, yearling, two year old). 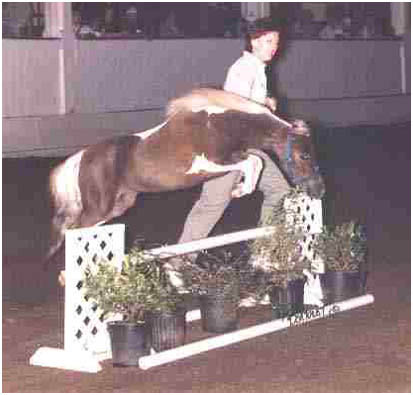 They are also shown in height catagories in both junior and senior horses based on their measurement at the show (under 28″, 28″ to 30″, 30″ to 32″, and 32″ to 34″). * There is a very active market for miniature horses throughout the world. We have shipped horses overseas as well as throughout the United States and Canada. *When purchasing a horse that does not have permanent registration, the buyer should expect to receive some form of “height guarantee” from the seller that the horse will not go over-height as an adult. We sell all of our young horses with a money back height guarantee if they should happen to go over height at 5 years of age. If you are looking for more detailed information related to miniature horses, you may try some of the topics that we have written on and are listed on our home page. If you have specific questions that are not answered here, you can E-Mail us and we will try to provide an answer for you.